299 Results exactly matching the search phrase. 0 Results matching titles words. 299 Results matching product descriptions. 0 Results matching title or description. The PAL/NTSC to NTSC/PAL Converter is designed to convert many kinds of video signal formats, including PAL, PAL60, NTSC3.58, NTSC 4.43 and SECAM into a PAL or NTSC signal output. 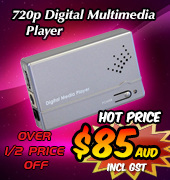 For example, if you have a device that runs on one of the PAL video formats, but your regular television uses NTSC, or vice versa, by simple switch selection, this converter eliminates that problem. 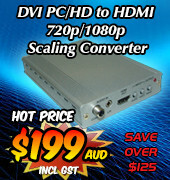 The ​1 x 4 DVI Splitter is a high performance, HDCP compliant DVI signal distributor/amplifier. One DVI signal source is split into four identical buffered outputs, each connecting simultaneously to four DVI displays. This compact yet functional device will allow the capture and conversion of an analog IR signal into a digital format and store it for later use. The 1x4 Optical Audio Splitter splits and distributes a single optical digital audio signal input to four optical digital audio signal outputs. This allows Users to share one optical source with four optical digital sound systems. The Analog L/R to Digital Audio Converter is designed to convert an Analog stereo audio signal from L/R input to Digital Coaxial SPDIF and TOSLink Optical outputs and works as a converter and/or splitter, allowing you to use one output or both at the same time. 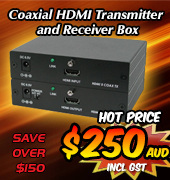 Stereo to SPDIF audio delay Converter Box is designed to convert an analog stereo audio signal from L/R input to Coaxial SPDIF and TOSLink Optical outputs simultaneously, with an additional selectable audio delay (150 millisecond) feature. The Coaxial/Optical to R/L Audio Converter is an easy to use product that converts Coaxial or Optical audio signals into Left/Right audio, supporting S/PDIF LPCM 2CH @ 24 bits (for left and right channel) and a sample frequency of 44.1, 48, 96kHz up to 192KHz. The Program Selector-SM-808H allows older televisions without AV inputs to view movies from your DVD/VCD player or to play games with your gaming console by converting the AV input signals to an RF output. 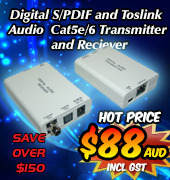 The USB Audio Converter Pro is designed to convert a USB audio signal into a Left/Right stereo or Optical audio output. It allows your PC audio signal to be output to an amplifier/receiver or speaker system for you to enjoy high quality audio.